Hope you all had an awesome holiday! Yesterday was so full of everything, and I am content and exhausted now. Before we went in for the family festivities, I decided to bang out a quick gift for my brother-in-law just because. 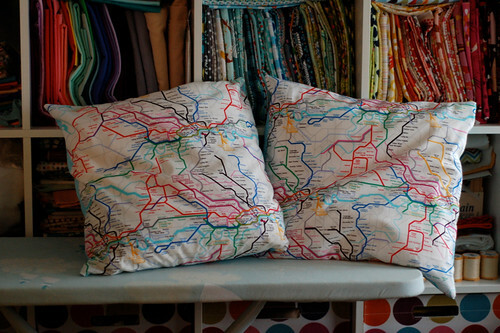 There are two things my brother-in-law is completely in love with – trains and maps. Any combination of the two brings him immense joy. Usually I just get him books or posters related to maps, subway maps, trains, or subway art. This year I was inspired to do something different. It all started with the fabric. I had bought this fabric months and months ago with the intention of making something for him this Xmas. I debated whether to make him a shirt but figured he would never wear it because that would be too flashy. He’s not into ties, and I really couldn’t think of any other form of apparel to make for a dude. Thanks to over-thinking this and then becoming hugely distracted with other projects and life and stuff, I found myself wondering what to make for him just a couple of night ago and on a whim decided to go with pillows. There really isn’t anything exciting to say about these pillows. They’re just super easy envelope pillows I was able to whip up in about 15 minutes. Really, the appeal is in the fabric, so hooray for Timeless Treasures for printing this! Funny thing, it took me longer to find a solution for wrapping them than it did to actually make them. In the end I just used some leftover binding as a ribbon. Didn’t make for much of a surprise when presenting it as a gift, but meh, it’s pretty. There is nothing wrong with envelope pillows. I made my first one for my husband for Christmas and while it took me way longer than 15 minutes (because of some hand sewing that I did as part of it), it was well received. This fabric is great, but it seems like the type of thing only truly excellent for pillows and quilts (with big blocks).